Get the look of your favorite celebrity for less inspired by your favorite runway designer. 2009 trends already have shown signs of cinched waists, big necklines, and taste of bohemian-chic appeal.Traditional looks will play a big part in men trends as well. 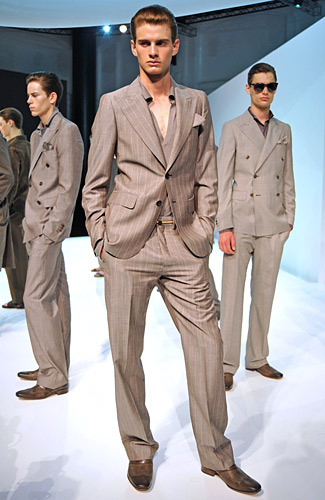 With remarkably detailed suits and polished shoes men will get a glimpse of the finer things while looking the part. To the untrained eye Color will also be evident in 2009 by the way of accessories to die for, like the neck scarf that many men are giving a go and we cant forget the sheer scarves that have been all the rave of summer 2008 making a guest appearance in 2009 as well. Bottom line is 2009 will be a year to try new mashed up styles together to create a look all your own traditional, rock, business, weekender. Trends don’t always have to be about the name brand or logo making the fashion statement. It is about how you wear the clothes without letting the clothes wear you. As we pass the torch from an entire year of skinny jeans, retro looks, bright colored suits and v-necks in 2008 the new looks of 2009 will represent even more unexpected pairings of colors, fabrics, retro looks as well as even more vibrant colors! Many ethnic styled ensembles made there way into contemporary American wardrobe. The sophisticated man made a comeback in white suits with bold button-down shirts in contrasting patterns and more fitted, rock star-inspired looks dominated the runways. Let us also not forget that in 2008 men took accessorizing to the next level with bow ties, bags, jewelry, eyewear and shoes that would even make the most feminine woman desirous.